This morning I was thrown a curve ball. It was my day to teach, and I was excited to engage in a conversation with the students about microfinance institutions, one of which was the subject of today's case. I arrived early to set up the classroom, only to be approached by one of the students, who asked for the case. I was confused, as we had left the cases with the photocopy machine administrators for the students to copy last night, just like the previous six days of teaching. He told me that Regis, our student liaison had taken them, and had told the students that he would be providing photocopies of the case in class this morning. To contextualize, we had essentially found that students were finding the method of distribution that the school's administration had recommended to us (of having students photocopy the cases themselves) was proving to be costly for some students. We decided to negotiate with administration, and purchased printing paper yesterday, after they agreed to let us print copies on campus, providing we supply the paper. We figured this would be effective for ensuring students' preparation, and announced that from Wednesday onwards we would be supplying copies of the case. Little did we know that Regis also sent out his own communication, and they were expecting today's case as well. So, if there was any doubt in previous classes whether or not students were reading the case, it was VERY clear today, that absolutely no one had any clue about the subject matter of the case whatsoever. Nevertheless, I knew we could still have an exciting discussion, and I didn't let this curve ball frazzle me for too long. I handed out the case, and gave everyone 15 minutes to quickly skim through the text. We then dove right into microfinance as a whole, and the students debated about whether it is good or bad. I was so proud of one student, Emmanuel, who was comfortable enough to hold his ground as the only person who saw cons in microfinance institutions, and voice his opinions to the class. It was a very healthy debate, and the key learning that I articulated to the students was that no matter how you personally feel about a business model, or business idea, you must consider the pros AND cons, and how they fit into the external environment you're operating in, in order to be the best decision maker possible. In the end, I was really happy with our class today, and was thankful for the enthusiastic participation from the students. I think the curve ball was actually a blessing in disguise, as the level of contribution increased dramatically today! The students were forced to be critical thinkers, responding to questions and debate topics, instead of rhyming off case facts, which was a huge jump up the learning curve for students. 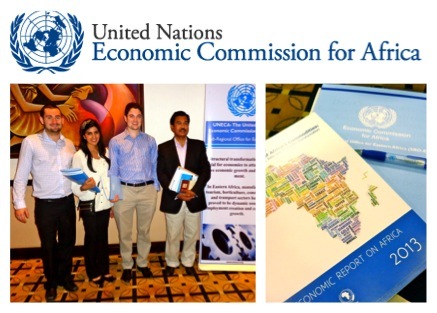 After lunch today, we ventured back to the Serena Hotel, but this time as official invitees to the launch of the 2013 Economic Report on Africa, presented by the United Nations Economic Commission of Africa (UNECA). We were the youngest attendees at the event, and were quite honoured to be present, listening to leading economists, academics, senior policy makers, and businessmen share their thoughts on the report's findings. The event featured discussions centred around the theme of how Africa must employ a commodity-based approach to industrialization and growth. Representatives from many of the embassies were present, and we were fortunate to meet a number of them, as well as individuals from the World Bank, UNECA, and some smaller tech companies, who were all eager to help us with our research. It was quite flattering to have so many people excited to meet us, and to exchange perspectives on the issues discussed.